Last week I bought a pair of mechanical Shimano BR-CX77 disc brakes for my Bike Friday Pocket Rocket. A friend of mine was selling them cheaply since he had upgraded to hydro/mechanical brakes. Later this month I’ll receive a new fork with IS disc tabs for my Bike Friday and will install one of these using the 160F post mount adapter. Tokyo Bike Friday dealer ehicle will be installing the fork and a new threadless headset for me, allowing me to convert my nearly 4 year old BF to disc brakes at the front. For now I won’t be changing the rear triangle and the rim brakes at the back, since most of my braking has always been on the front. Another friend of mine is interested in picking up the rear brake for his bike (his fork and front hub don’t support discs). Thus we both get a bargain price upgrade out of this pair. Depending on how I like the second hand CX77 in action, I may then buy a new pair for use with my Elephant Bikes National Forest Explorer (NFE). Finally here is one of the Compass Babyshoe Pass Extralight tires (650Bx42) that I’ve bought for the NFE. These should make for a cushy but fast ride. A friend of mine is using the 700Cx32 Stampede Pass tires and loves them. A century ride in cycling terms is a ride of at least 160.9 km (100 miles) in a day. I started doing them in March 2012 and since then did one every month except August 2012. Thus my current streak started in September 2012 and August 2015 was month #36. I wanted the ride completing 3 years of what some would consider insanity to be special, so I combined it with one of my New Year plans, a Japanese coast to coast ride. 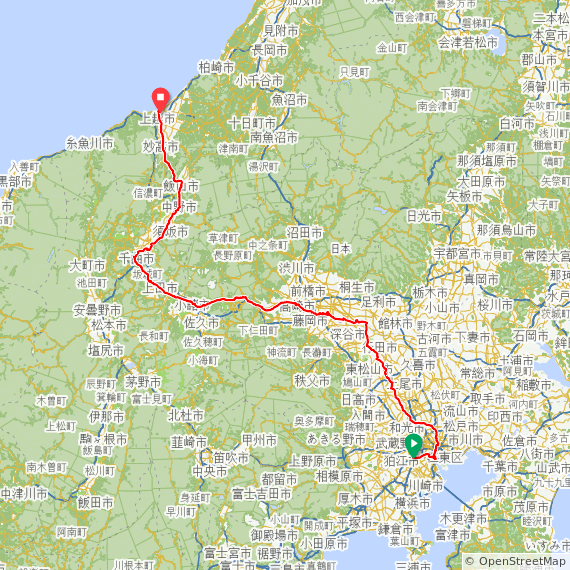 Around Tokyo “coast to coast” amounts to a distance around 350 km. Because of the size of the Kanto plain and because of the river valleys on the other side the route can be mostly flat, but with some mountains where you cross the watershed. My friends Alan and Naomi had done a coast-to-coast ride back in 2009, so I asked them for the route, which turned out to be a great one. They sensibly did it in two days, staying overnight at Karuizawa, a resort town up in the mountains near the highest point, which is a popular escape from the summer heat for Tokyoites. For my friends it was a 190 km ride one day, followed by a 09:00 start for the 160 km ride the next day. They did it in early September, when it’s is still pretty hot here. I got my son Shintaro to join me on this route, but decided to ratchet it up a notch for the three year ride, riding it without a nightly accommodation stay. We did it during August, during a heat wave when it was hotter in Tokyo than it was down in Singapore. Shintaro had joined me for a 300 km brevet in March (his first) and had no problems completing it, so I guessed he would do OK with fitness. We left home around 08:15 and headed over to Rainbow Bridge on Tokyo bay as the Pacific starting point. All the cycling roads are asphalted, so we basically rode on a black solar collector all day. The temperature in the city was already at 35 C. By the time we got out of town and followed the mostly exposed Arakawa river cycling roads, the temperature hit 40 C. It stayed between 39 and 43 C until the mid-afternoon as we made our way along the Arakawa and Tonegawa. We drank plenty of water but the heat was brutal. We both carried two water bottles and refilled them at every opportunity. If we came across a tap by the time we had only gone through the first bottle, we always dumped the contents of the other one to refill it as well, because by then it was already as hot as bath water! By the late afternoon it became a bit easier. By the time we reached the main climb to Usui Pass (about 900 m) near Karuizawa it was dark. As we gained elevation and the stars came out temperatures finally dropped below 30 C. All the curves on the Usui pass are numbered, from 1 to 184. The scariest moment of the ride was when we both, climbing separately, passed a grunting wild boar by the roadside. We both sped up in panic to get away as quickly as possible… Fortunately it didn’t chase us. We reached Karuizawa 202 km from home around midnight. The roads were mostly deserted as we followed rolling hills, keenly anticipating the promised descent into Nagano prefecture. It took longer than expected before the long, fast descent began. The temperature had dropped to as low as 19 C and I put on a wind breaker. Some time after 01:00 Shintaro started getting sleepy, so we pulled into a convenience store parking lot and found a sheltered place behind the building, where we lied down on the bare concrete to sleep, using our rinko bags (to wrap up the bike for train rides) as pillows. Around 04:30 we woke up again from the cold and decided to head on. Nagano was beautiful in the early morning light, with mist sitting on surrounding mountains. As the morning turned into day it gradually heated up again. We mostly followed cycling roads on flood control dams along the rivers, away from traffic, but also exposed to direct sunshine. Despite using sunscreen my arms were red from sunburn and my son had trouble sitting after so many hours on his roadie saddle (he has a Brooks on his touring bike). Around midday we got to the second highest climb of the course, from one river valley into the next. By that time we were both weary and just wanted to get to the coast, so we could say we finished the ride. We shared a bag of dried mangoes, my “secret weapon” for when rides get tough. I can’t say much about the final kilometres, except that we counted down the (estimated) distance to the coast during the hottest time of the day. After 362 km, we made it. We had some udon noodles at a restaurant near the train station, packed our bikes into the rinko bags and headed back to Tokyo via express train and the Shinkansen (bullet train). I slept most of the way. My wife picked us up by car at the station in Tokyo. Having felt pretty exhausted on rides in the July heat ranging from 88 km to 164 km, I knew a coast to coast ride in this weather was going to be more crazy than fun. Nevertheless, I knew we could do it and wanted to go through the experience.